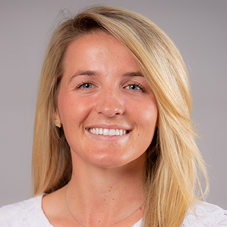 Kelly Nielsen joined the University of Arkansas golf program in January 2019 as the Razorbacks’ first Director of Golf Operations. Nielsen is responsible for day-to-day operations with the Razorbacks’ nationally competitive women’s and men’s golf teams. Her duties include assisting with travel, scheduling, academic progress, community service and administrative assistance. Nielsen first joined the Razorbacks in May of 2018 as a graduate assistant for the athletics department administration. In this role she coordinated new employee onboarding, developed staff and faculty events, assisted with an audit of internal brand signage and procurement. Prior to joining the Razorbacks Nielsen was a student and an intern in the marketing department at Kent State University. She graduated with a bachelor of science in sport administration in May, 2018. Nielsen was a member of the Kent State golf team along with her twin sister Kasey and her younger sister, Kory. Nielsen is currently pursuing her master’s degree in Recreation and Sport Management at Arkansas. Nielsen comes from an athletic family as she and her sisters followed in her mother, Sharon’s footsteps. Sharon was a collegiate golfer at Northern Illinois. Father Joel played football at Minnesota State and is currently the Director of Athletics at Kent State.